LEFT: Building façades with painted gables in Appenzell. The town of Appenzell may seem touristy at first glance, especially in summer. Still, that's a small price to pay for the preservation of a town's heritage--and if you see a farmer walking barefoot with an earring dangling from one ear, you can be sure that he isn't doing it to impress the rubes from the city. 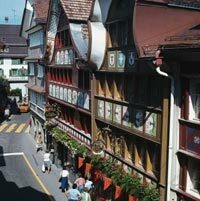 Museum Appenzell - History and culture of the town and canton, from ancient times through the present. Museum of Art Appenzell - Inside this museum's avant-garde building, you'll find works by the artists Carl August Liner and Carl Water Liner along with other examples of modern art. The Liners are also featured in the Kunsthalle Ziegelhütte, which includes a 16th Century brick kiln. Ebenalp, a 5,394-ft. (1644m) mountain that you reach by cablecar from nearby Wasserauen, at the end of the Appenzeller Bahn railroad line. From the summit, you can walk to a cave that was once occupied by religious hermits. Säntis, the highest mountain in Eastern Switzerland. Take the train to Urn�sch and a bus to the jumping-off point of Schwägalp. From the latter, an aerial cablecar lifts you to the 8,209-ft. (2,502m) peak of the Säntis, where you can see across Lake Constance into Germany on a fine day. Walking or biking in the surrounding hills is a pleasant, inexpensive diversion. Appenzell is one of the greenest and prettiest regions in Switzerland, with 750 miles (1200 km) of well-marked paths that don't require mountain gear or a head for heights. Depending on the time of year and your itinerary, you may encounter herds of miniature cattle--the smallest cows you're likely to see anywhere. You can check transportation schedules at the Appenzell railway station or at www.sbb.ch.